Why Did Nephi Say Serpents Could Fly? When Nephi’s brothers were mocking him for attempting to build a boat, Nephi reminded them of the miracles the Lord worked for their ancestors when they wandered in the wilderness, after having been led out of Egypt (1 Nephi 17:17–42). As Nephi told the story of the brazen serpent, he spoke of “flying fiery serpents” (1 Nephi 17:41),1 instead of simply “fiery serpents” as found in the biblical narrative (Numbers 21:6, 8; Deuteronomy 8:15). Israelite stamp seal of a winged serpent. Image from Biblical Archaeology Review. See footnote 6. Given the protective role of the seraphim, one way to interpret the role of the serpents in the wilderness was as protectors of the promised land—keeping the wicked away from those sacred grounds. But the Lord provided a way for the Israelites to enter the promised land—repent, and look to the brazen serpent, raised upon a pole (Numbers 21:4–9). When Nephi told the story a second time, he drew parallels between the brazen serpent and Jesus Christ (2 Nephi 25:20). Later Nephite prophets “saw the raised brass serpent as a prophetic metaphor for Jesus’ crucifixion” (see Alma 33:19–23; Helaman 8:14–15).12 Such associations make sense in light of the Israelite connections between the winged serpent and the Davidic king. Nephi understood that it was ultimately a sign of the Messiah—the true Davidic king. The people of Jerusalem had become wicked, and were going to be destroyed. Like the Israelites of Moses’ day, Lehi’s family had fled into the wilderness and needed to look to the Messiah—“lifted upon the cross” (1 Nephi 11:33)—to live. Jeffrey M. Bradshaw, "Did Satan Actually Deceive Eve?" KnoWhy JBOTL04A (January 15, 2018). S. Kent Brown, “Brazen Serpent,” in Book of Mormon Reference Companion, ed. Dennis L. Largey (Salt Lake City, UT: Deseret Book, 2003), 171–172. S. Kent Brown, “Fiery Flying Serpents,” in Book of Mormon Reference Companion, ed. Dennis L. Largey (Salt Lake City, UT: Deseret Book, 2003), 270. Andrew C. Skinner, “Serpent Symbols and Salvation in the Ancient Near East and the Book of Mormon,” Journal of Book of Mormon Studies 10, no. 2 (2001): 42–55, 70–71. 1. Royal Skousen, ed., The Book of Mormon: The Earliest Text (New Haven, CT: Yale University Press, 2009), 54. The word order, with flying coming before fiery, is found in the original manuscript. See Royal Skousen, ed., The Original Manuscript of the Book of Mormon: Typographical Facsimile of the Extent Text, The Book of Mormon Critical Text Project, Volume 1 (Provo, UT: FARMS, 2001), 142, line 15. As it appears in Isaiah 14:29 and 30:6, the phrase “fiery flying serpents” (discussed above) is a translation of seraph meopheph, with seraph alone meaning “fiery serpent.” Assuming similar language underlies the translation of Nephi’s statement in 1 Nephi 17:41, the original word order, with flying before fiery, more accurately reflects the Hebrew. See Royal Skousen, Analysis of Textual Variants of the Book of Mormon: Part One, 1 Nephi 1–2 Nephi 10, The Book of Mormon Critical Text Project, Volume 4 (Provo, UT: FARMS, 2004), 369–370. 2. The Hebrew term translated as south in the KJV is negeb or negev, and refers to the desert between Judah and Egypt. See Joel F. Drinkard Jr., “Negev,” in HarperCollins Bible Dictionary, rev. ed., ed. Mark Allan Powell (New York, NY: HarperOne, 2011), 694–695; Lynn Tatum, “Negeb,” in Eerdmans Dictionary of the Bible, ed. David Noel Freedman (Grand Rapids, MI: Wm. B. Eerdmans, 2000), 955. See alternative translations such as the NIV, NRSV, and JPS, which make it clearer that the Negev is what is being referred to. On the children of Israel being in this area during the brazen serpent incident, see K.A. Kitchen, On the Reliability of the Old Testament (Grand Rapids, MI: Wm. B. Eerdmans, 2003), 193–194. 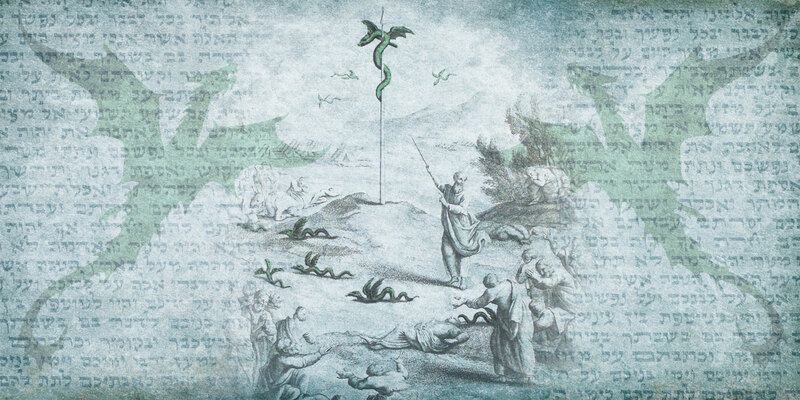 Other historical accounts also mention “flying serpents” in this desert region. See Wallace E. Hunt Jr., “Moses’ Brazen Serpent as It Relates to Serpent Worship in Mesoamerica,” Journal of Book of Mormon Studies 2, no. 2 (1993): 127–129. For a proposed candidate for the “fiery flying serpent,” see Ronald P. Millet and John P. Pratt, “What Fiery Flying Serpent Symbolized Christ?” Meridian Magazine, June 9, 2000. See also, Elder Glen O. Jenson, “Look and Live,” Ensign, March 2002, online at lds.org. 3. In both Numbers 21:6 and Deuteronomy 8:15, seraph is used with nahas, “serpent,” where as in Numbers 21:8 and Isaiah 14:29; 30:6 it is simply seraph, which are clearly serpents in context. 4. See J.J.M. Roberts, First Isaiah, Hermeneia—A Critical and Historical Commentary on the Bible (Minneapolis, MN: Fortress Press, 2015), 95–98; Marvin A. Sweeney, “Seraphim,” in HarperCollins Bible Dictionary, 935–936; William B. Nelson, “Seraphim,” in Eerdmans Dictionary, 1186; Matthew A. Thomas, “Serpent,” in Eerdmans Dictionary, 1188; Abigail Stocker and John D. Barry, “Seraphim,” in Lexham Bible Dictionary (Bellingham, WA: Lexham Press, 2016). 5. Roberts, First Isaiah, 96–97, 226. 6. Shlomit Weksler-Bdolah, Alexander Onn, Shua Kisilevitz, and Brigitte Ouahnouna, “Layers of Ancient Jerusalem,” Biblical Archaeology Review 38, no. 1 (January/February 2012): 40. 7. Kitchen, On the Reliability, 52, 59; Mordechai Cogan, “Into Exile: From Assyrian Conquest of Israel to the Fall of Babylon,” in The Oxford History of the Biblical World, ed. Michael D. Coogan (New York, NY: Oxford University Press, 1998), 325; Steven L. McKenzie, “Judah, Kingdom of,” in Eerdmans Dictionary, 746; Israel Finkelstein and Neil Asher Silberman, The Bible Unearthed: Archaeology’s New Vision of Ancient Israel and the Origin of its Sacred Texts (New York, NY: Touchstone, 2001), 243; Charles H. Miller, “Jerusalem,” in HarperCollins Bible Dictionary, 447; Nicholas R. Werse, “Hezekiah, King of Judah,” in Lexham Bible Dictionary. 8. Jeffrey R. Chadwick, “Lehi’s House at Jerusalem and the Land of his Inheritance,” in Glimpses of Lehi’s Jerusalem, ed. John W. Welch, David Rolph Seely, and Jo Ann H. Seely, (Provo, UT: FARMS, 2004), 87–99, 118–124; Brant A. Gardner, Second Witness: Analytical and Contextual Commentary on the Book of Mormon, 6 vols. (Salt Lake City, UT: Greg Kofford Books, 2007), 1:32; Brant A. Gardner, Traditions of the Fathers: The Book of Mormon as History (Salt Lake City, UT: Greg Kofford Books, 2015), 65–67. 9. Weksler-Bdolah, et al., “Layers of Ancient Jerusalem,” 40. 10. Roberts, First Isaiah, 95–96. 11. Roberts, First Isaiah, 226. 12. S. Kent Brown, “Brazen Serpent,” in Book of Mormon Reference Companion, ed. Dennis L. Largey (Salt Lake City, UT: Deseret Book, 2003), 172.